The first thing I suspect you will quickly realize about me is my never-ending stoke to be out sharing the mountains with people, whether on rock, on glaciers, or on skis. I’ve had folks tell me that my passion to be out in the mountains has helped to spur them to greater heights. I am an internationally licensed IFMGA/UIAGM mountain guide, meaning I am certified as an Alpine, Rock and Ski guide through the AMGA. 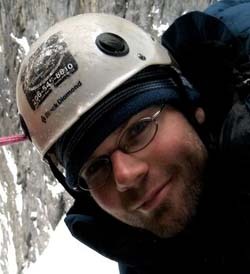 Some of my experience ranges from having established over a half dozen first ascents in my home range of the Cascades, as well as opening new routes in farther off regions such as the Waddington Range of BC, Patagonia, and in the Alaska Range. I have authored a climbing guidebook entitled SuperTopo: Washington Pass Climbing and I’m a long time writer and regular contributor for OutdoorGearLab.com. I have instructed over 40 avalanche courses as an AIARE Level 1 and Level 2 Course Leader. I have been twice the recipient of the ACC Fellowship Grant and other certifications I hold include being a Wilderness First Responder, AAIRE Level III Avalanche training and Leave no Trace Trainer. Recently, I have been working with the American Safe Climbing Association, replacing nearly 100 bolts in the last 2 1/2 years.